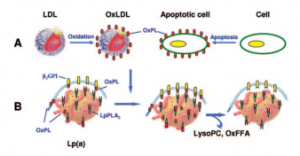 On this episode of the Cholesterol Code Workbook, we discuss five papers about the most mysterious lipoprotein: Lipoprotein(a). 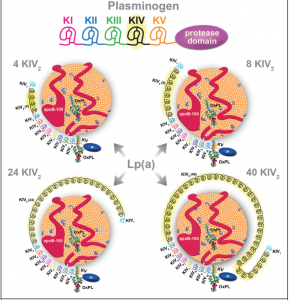 We discuss its involvement in wound healing, its role as a carrier for oxidized phospholipids, and potential influences on risk for cardiovascular disease. Take a seat, grab a snack, and join us as we venture into the puzzling curiosities of lipoprotein(a)! Note: All images used are for the purpose of discussion and entertainment, all credit is given to the original authors. Figures come from the studies they are represented under. I really appreciate all your work on this subject. I just discovered you as I recently embarked on a Keto diet. I’ve seen a number of your YouTube presentations and read many of your blog entries (I have listened to your appearance on the Keto For Normies podcast at least three times now) and I think at this point I understand the basics of cholesterol and its effects on people who follow LC/HF diets – even though I wasn’t born with the brain of an engineer. That’s to your credit, the way you present this incredibly complex information in an understandable way is impressive. That said, and I know you hear this a lot, I think I may be one of those people who has seriously high LDL levels because of the, as you’ve put it ‘bad reasons’ (not dietary fat, heredity or something else). If I’ve calculated it right, my Remnant Cholesterol number is pretty terrible. My HDL isn’t bad and my Triglycerides aren’t terrible – in fact my HDL/Tri ratio is ideal – but these LDL numbers are making me feel like you did when you first saw your own numbers and determined to learn more about how cholesterol works. What I’m hoping to get from you is not medical advice – I understand the disclaimer – but some guidance on what to do next. A quick bit of background – although I’ve been eating low-carb for more than five years or so now, I’ve really just recently started following a real Keto diet – I didn’t know much about tracking macros, moderating protein, being mindful about calories, making sure I got enough fat etc. until a few months ago. I’m a 5’8”, 53-year-old male – reasonably lean when I started Keto – when I began the diet in earnest in February of this year I was at 20 % body fat – 159 lbs. I haven’t taken any new measurements since then, but I’ve noticed significant changes in my body composition, I’ve never felt better and going by the way my clothes fit, I’ve lost visceral fat all over, particularly that persistent pooch on my belly. That’s where I was headed when I had an annual physical last week and I saw the numbers that are freaking me out. I should say, since I’ve been following an unstructured low-carb diet for years, I’ve had this argument with my physician about taking statins for at least two previous blood tests, and he’s indulged me so far and urged me to alter my diet (he doesn’t get it), but these latest LDL numbers have convinced him this is genetic. And, he may be right, I’m afraid. Since I was adopted, I have no family history to go on, so I’m trying to be as cautious as I can. That’s the reason I chose not to do the Feldman protocol for this blood test, as I’d like to get a real sense of the numbers. I’ve considered taking it again with the protocol, but I’m not sure what that will accomplish. I’m thinking I should have a calcium scan and an NMR particle test, but I don’t see any way around this except for altering my Keto diet or just taking the statin. If you’re still reading this (I am sorry this is so long), what do you think? I really appreciate you taking the time. Quite a significant difference… although it’s a bit higher than I usually see in low carbers (I prefer my triglycerides to be below 100 mg/dL, and RC to be below 20 mg/dL) it’s not terrifyingly high like the previous calculation was! Could there be anything confounding your lab results with this that may cause higher remnant cholesterol and triglycerides (>20 and >100 respectively)? It may also be helpful to get a look at the bigger picture as well. Even in people with higher levels of LDL for genetic reasons, the risk for heart disease tends to be paired with insulin resistance and high insulin levels. hs-CRP would also be another indication of unsavory things going on. With that said, over the years your profile *has* improved, even by conventional standards of triglycerides and HDL alone. Triglycerides have come down 50 points – which is fantastic, in my opinion! Of course, I also intend to get a calcium scan (heart disease runs in the family) and it has the benefit of measuring the actual disease. CIMT (Carotid Intima-Media Thickness test) also measures one of the earlier signs of arterial thickening, using an ultrasound. All of these things together (insulin, hs-CRP, CIMT, CAC, looking for possible confounders of the test) may help form a clearer picture of what’s actually going on. It’s reassuring to have you looking into these numbers. I’ll just mention that I, indeed did consume coffee the morning of the test and the days leading up to it – also coconut oil and MCT oil (MCT at least one of the days) – I think I did the fast right, but maybe not, I did put 2 TBS of heavy cream in my coffee that morning. I should also point out that in those days before the test, I was intermittent fasting (16/8) – that’s a regular part of my Keto regimen. I very much appreciate this. Is it possible for you to do a retest after a week or two of no coffee/mct/coconut oil to see if it resolves the higher trigs? And make sure you *water fast* 12-14 hours before the blood draw. Intermittent fasting as usual is fine in the days leading up, as far as I’ve seen, just make sure to time your meal so you’re 12-14 hours fasted before the draw. I think this is worth a retest, too many confounders to get reliable data! I think you’re right – I can manage going without coffee etc. for a few weeks (that coffee part won’t be easy, I confess). I’ll schedule a new test. This time I’ll get the fasting part right (not sure what I was thinking). I’m grateful for your time. No issues with asking questions, better to ask them and catch potential slip-ups beforehand rather than have to do another retest! RE: Coffee we’ve seen people cease caffeine for 11 days and have successfully seen a reduction in triglycerides, if that is what was causing the higher numbers. So ten days might be enough, between 10 to 14 days is where I’d shoot for as that’s the typical length of time I’ve seen have success so far. I would say, since you’re testing coffee, to not do the Feldman protocol for now. That way we can keep the variables to a minimum. Same for calorie restriction, it can influence numbers so go ahead and eat maintenance calories for at least the 5 days leading into the test (or the whole ten days, either one) just to make sure it doesn’t influence anything. I do intend to get a CAC done… I’ll be bringing it up with my doctor next month, and will seek one out independently if that doesn’t work. As for the bruise, in my own experience minor bruising doesn’t seem to impact results much. Breaking a leg, probably, but not bruising. If you’re concerned you could certainly reschedule just in case though so you don’t have to do another re-test! Siobhan, Got my NMR profile back – and I’m not sure what to make of it. The actual cholesterol numbers didn’t change much – like I expected my total cholesterol went up from the 493 (in my first post to you) to 510 – my trigliceryides went down from 107 to 101 – my HDL went up from 96 to 99. Most of the other markers are optimal (C-reactive protein >1.00 – Homocyst(e)ine, Plasma 12.7 – LP-IR <25) BUT my LDL-P number is astronomical at 3500! And yet my small LDL-P is at <90. I’m utterly confused. What do you make of that? Should I be worried? I’ll also add I recently did a bodpod test and my body fat percentage continues to drop (currently at 18%) and so does my weight (down three more pounds – while increasing muscle mass). Are these results after not drinking coffee for the 10 or so days that you mentioned before? You didn’t post your LDL-C but I expect it’s around 350ish? LDL-P tends to be LDL-C x10 (roughly), so that’s about what I would expect. Paired with the higher HDL/lower TG this is generally reflective of someone who’s running on fat. The LDL-P is likely high because you’re using them to transport fat to your cells, so it’s reflecting higher demand for fat-based energy (as I’d expect). Hi again, Yes, these are the results after not drinking coffee (or consuming MCT/coconut oil). LDL-C is 391. I can’t say I understand the difference between the LDL-P number and the Small LDL-P number – does the <90 indicate I don't have a concerning number of small-dense particles, or am I missing something? If I understand this right (which I barely do), it's the number of particles and the size of particles that are the indicators of risk. Anyway, thanks as always for taking a look at these. I always feel better after I hear from you. Yes, okay, so with an LDL-C of 391, an LDL-P of 3500ish is pretty much what I’d expect. LDL-C is a measure of the cholesterol in the particle, and LDL-P is a measure of the actual particles – so they tend to mirror in healthy systems. Also yes, <90 Small LDL is essentially indicating that the number of smaller particles is low enough that it can't be quantified exactly. That's exactly what I typically see in people who are utilizing fat properly (high LDL, high HDL, lower trigs). As for particle count - it can sometimes relate to risk, but typically from the studies I've seen that tends to be when paired with other markers like triglycerides >120, low HDL, high CRP, high insulin, etc. LDL can be upregulated to traffic energy (such as in lean mass hyper-responders), but it can also be upregulated as a part of the immune response, in which case it presents with other signs of distress. I’ve not yet seen a study showing higher LDL-P sans high TG and low HDL increases risk, although I continue to search for one. Also if I just started lifting heavy weights and and my muscles are tearing and repairing bigger would that call for a bigger amount of lp(a) to help with the wound healing . Thanks guys love this stuff ! 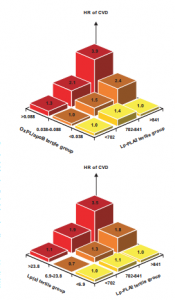 Hi – typically from what I’ve seen in the literature raises in lp(a) from environment are typically paired with a worsening lipid profile overall (low HDL, high trigs, pattern B). It’s not so much that the low HDL and high TG is harmful in itself but rather that this is indicative of damage or other issues which lp(a) may also react to. 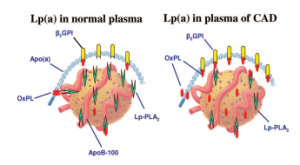 Lp(a) also isn’t so much an alternative to HDL – HDL typically handles excess or damaged cholesterol, while lp(a) deals with oxidized/damaged phospholipids (the “shell” of lipoproteins and cells). So they are not doing the same job but they could be considered to be working in the same department. As for exercise I haven’t seen any studies on it, lp(a) seems to be slightly more specific than other acute phase reactants as far as what it goes up from. We also don’t typically have people testing it so our own dataset isn’t particularly large enough to investigate either. Is there any known relationship between an elevated CRP level and an elevated Lp (a)? I don’t think high CRP necessarily causes high Lp(a), nor is one necessary for the other, but it is possible that both can be elevated for the same reason (damage occurring, etc) but it’s not really a guaranteed relationship. With that said, by looking at my own data there does seem to be a possible correlation, but it’s fluctuating around my lp(a) baseline (determined genetically) it seems. Thanks for asking this question, because it isn’t something I’d thought to look at previously. I’ll definitely keep an eye on it and see what happens with it. Thanks, Siobhan! I have elevated Lp(a), also. As I was listening to you and Dave review the studies and speak about the processes it suddenly made me think of the CRP. I will have to go back and review, but I’m pretty sure the one time I was tested for Lp(a) , my CRP was quite elevated (around 18…no idea why). My CRP has been checked twice since then and was <1, but Lp(a) has never been retested. Seems I recall the MD indicating that it was a test that only needed to be done once in a lifetime (but I would like to know how much it can change…and can it also be manipulated). Dave did mention that his changes, if I understood him correctly. I am an nurse, so this is all very interesting to me. It is also very frustrating at the same time because so little is known. Thanks to you and Dave for all the effort you put in to these videos. I think it is so interesting that A non-medical person is asking questions that the medical community should have asked. I think the two of you may end being the change agents for this issue! Thanks, again! No problem! I did some further checking into mine and Lp(a), for the most part, seems to correlate with both CRP and ferritin which are both acute phase reactants. It seems my Lp(a) is fluctuating around a baseline (likely genetic – for me about 130 nmol/L) but for the most part in lockstep with CRP/ferritin as they go up/down. It isn’t perfect (some outliers), but it is interesting and it’s got me on a bit of a tangent looking into it! Granted I do have only a handful of data points for right now. I’ll be adding on a couple more tests after this experiment to keep a closer eye on it. Thanks for the well placed question – massively helpful! P.S. It would definitely be of interest to me if you got it retested, to see if it has gone down, even a small amount. I will definitely let you know the results and will request a retest if my Lp(a)…it may take a bit of time to make that happen, but I will get it done. Thanks for your responses…I’ve learned a lot from you! D9id you repeat your Lp(a) after the week of pasture fed and finished beef? I read as you that supplementation with L Carnitine can contribute to lowering Lp(a(. Beef has way more carnitine than pork. Do you suppose that is a reason that your Lp(a) dropped when you switched from pork to beef? Yes I did grass-finished beef with a similar result to grocery beef and then a test while sick (on beef) and another while back on pork. Interestingly it appears to be slowly going back up not a sudden spike, so L-carnitine is definitely on my radar. I’m going to continue pork for a few more weeks and then get another test, to see if I can get it back up to 130 nmol/L then try pork + L-carnitine to see if it drops.